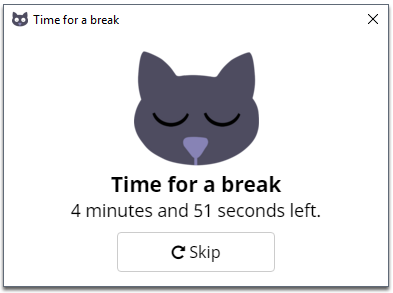 A little open source break timer. Available on OSX and Windows. The project is hosted on GitHub. You'll find the repository here and can download the latest builds from the releases here. How long you should be working for between breaks. How long each break should be. If you're in the middle of something at the time of your break, you can skip it. You'll be given the length of a normal break before you're prompted again. The "Skips" setting defines how many times you can do this. If you have skips enabled and you close the break window, that will count as a skip. If you close it after you've used all your skips or you had none set, the clock will reset (naughty). Rather than just timing you, the clock will only progress when you've been active. Mouse checks if your cursor has moved recently and Windows checks if you've switched tasks. Currently it can't track keyboard activity but I hope to add that soon. If you disable both mouse and windows, the application works as a timer. 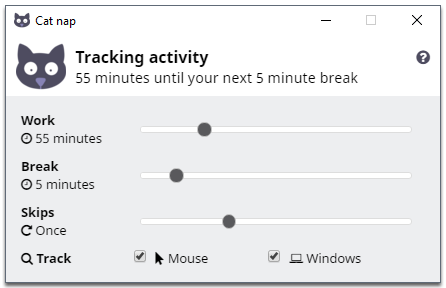 Note: for the window tracking to function, the settings window must remain open. Toggles the application on and off. Attempts to set the application to open when you turn on your computer. Begins a break early. When the break is over, you'll have a normal work period before the next one. If you need some help, have a suggestion or in the likely event that you find a bug - please create an issue. The project is open source and hosted on GitHub. Contributions are very welcome.